Guest bloggers are our favourite — they provide us with new insights into the world of knowledge translation and patient engagement through their own unique lens. This week we introduce Joanne Wincentak, knowledge broker for Holland Bloorview Kids Rehabilitation Hospital in Toronto, Ontario. On Twitter as @Joanna, her feed is a goldmine of resources for knowledge translation and research. 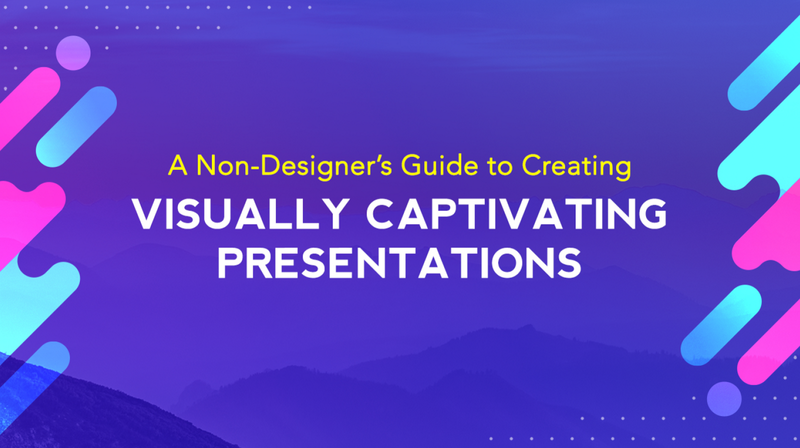 When she shared Visme’s e-book on creating memorable visual presentations, we thought it would be fitting to ask her to summarize this 121-page guide into a more digestible blog post. Knowledge brokers are often tasked with sharing key messages with target audiences in a visually compelling way (posters, presentations, guidelines, etc.). If you’re like me, you might have a couple of go-to visual communication tools like infographics, fact sheets and slide decks. Sometimes my vision for communicating key messages is clear, but that’s not always the case. I think almost all of us have been here before, staring at a blank slide deck or document, not knowing where to start. We know from experience and from research that good design is important if you want your audience to pay attention and remember your key messages [1,2]. The goal of creating something visually appealing can be daunting. We might already have a good idea of what the key messages are, and the story we are trying to tell, but get stuck on how to visually communicate them. At 121 pages, the guide contains a wealth of principles, tips and examples on how to create visually captivating presentations. But what’s best is that most of the content is useful no matter what type of visual communication tool you’re creating, whether it’s a TED talk-style presentation, a report, or an infographic. Nevertheless, it’s still 121 pages. So for your convenience, here’s an infographic that outlines my seven favourite design tips for creating visually appealing everything and anything that I pulled from the guide. Next time you embark on a dissemination product, keep these tips in mind. Remember, these principles take practice, and design is an iterative process. This particular blog has focused on Visme, since they produced the e-book being summarized, but there are other similar (and free) tools out there for creating stunning visuals. Other online tools include Infogram, Piktochart and Canva — and more are emerging regularly. Though many are free to use, as the old adage goes, “there’s no such thing as a free lunch”. As you may have noticed (how could you not?? ), the infographic above has a Visme watermark on every panel. These can be removed with a paid subscription, of course. But this kind of minor inconvenience should be noted as a potential limitation and factor into your choice of design tool. Note that Visme subscriptions start at $15 a month — for about the same price, you can subscribe to Adobe InDesign ($15.39/month). As a knowledge broker (or really, anyone looking to share information visually), you should be looking for a tool that fits your specific needs, and works best for you and your workflow. More importantly, always be on the lookout for the next useful tool to improve your knowledge products and make your job easier. Champlin S, et al. Perceptions of design quality: An eye tracking study of attention and appeal in health advertisements. J Comm Healthcare, 2014;7(4):285–294. Lazard A, et al. User evaluations of design complexity: The impact of visual perceptions for effective online health communication. Int J Med Informatics, 2014;83(10):726–735. Joanne Wincentak is a knowledge broker on the knowledge translation team (Evidence to Care) at Holland Bloorview Kids Rehabilitation Hospital in Toronto, Ontario, Canada. She is passionate about identifying research evidence to support clinical practice and has recently gained interest in information design. Find her on Twitter as @jwincentak.